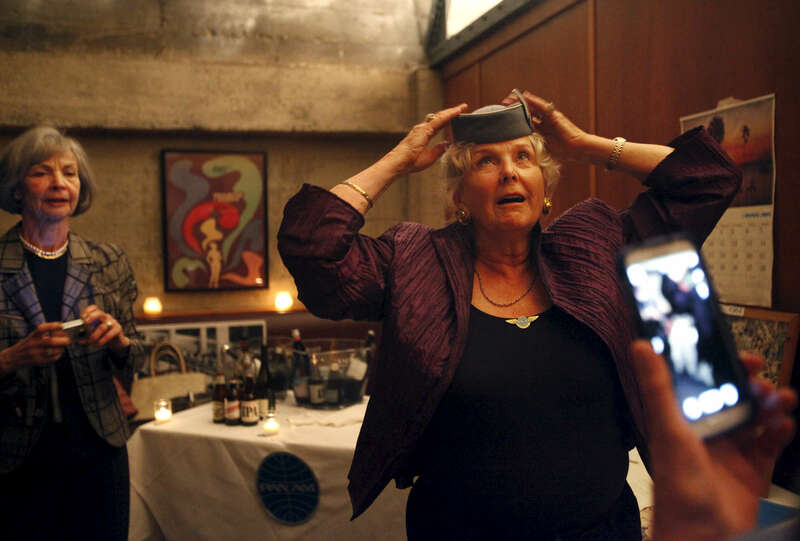 Kay Oppenheimer, 71, of England tries on a vintage Pan Am hat as Edith Kipping, 73, of Germany, right, and Karin Brodhl Persson, 72, of Sweden, left, prepare to take her picture during the 50th reunion of Pan Am Class 12 May 19, 2014 at the San Francisco Foreign Cinema in San Francisco, Calif. In 1964, 16 women from the United States, England, Norway, Sweden and Germany, among other countries, arrived in New York to train as Pan American flight attendants. Of that crew, 14 of them were assigned to San Francisco as a flight base and two to New York. The group has stayed in touch and remained close friends over the past 50 years. "This is a special group, an eclectic group," said Karin Brodhl Persson, "somehow we managed to stick together, it's our family in America."